Is a high mileage 04-05 Mazda 6 S wagon something to fear? I am looking for a used car to become my new DD. 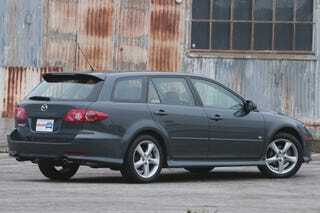 I have found two Mazda 6 S wagons for sale with really high mileage. One is 2005 with 151,000 miles from a private seller the other is a 2004 with 120,000 miles from a Mazda dealer. I was thinking I could get an extended warranty from the dealer and maybe not have to worry. Has anyone had experiences with this generation Mazda 6?